Today I'll discuss what I think is a misunderstanding of how tools should be used in the JS development workflow. I wrote back in 2015 about the state of front end tooling and since that post it’s continued to be a topic I follow with interest. I’m particularly interested in other people’s perceptions of where the JS community is up to in terms of tooling and what people expect to be provided when they start working with a library. What I struggle to understand most is why there is an expectation that React should provide (or be easy) to get working very straightforwardly. I suspect this is partly because React has always been written using JSX and hence some form of transformation has always been required, even if you avoid using React’s ES2015 class syntax in favour of React.createClass. To try to demonstrate how this tooling fascination is mostly avoidable when starting out, I want to show how I would set up a React project if someone new to the library wanted to get up and running and have a play around. In the past I would have done this by dropping Babel into an HTML file as a script tag - something that would mean we could get started with no npm required - but Babel 6 removed that functionality which means we do have to dive into Node land. I’d then create a folder src, and create src/app.js. Note that there’s no ES2015 modules or any of that, we’re just creating all our components globally for now. I’m focusing on getting up and running with a React project quickly and with as little friction as possible. Once the person gets more comfortable we could layer in additional functionality - starting probably with CommonJS modules. Now we need to install the Babel CLI tool and run it on the files in the src directory to produce bundle.js. 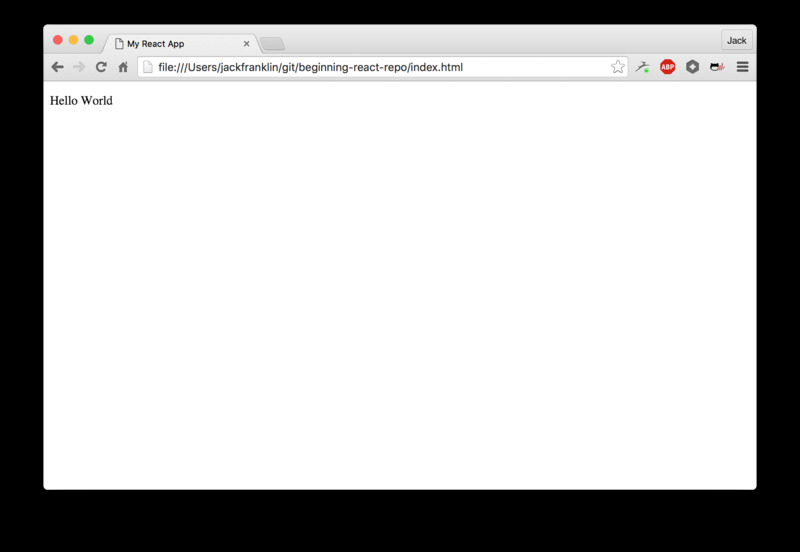 First I’d install babel-cli and babel-preset-react locally. I always install CLI tools locally such that different projects are able to use different versions of tools if they need. Before doing the install I’d first run npm init -y to create a package.json for us. And then we don’t even need a file server to run our app - simply opening index.html in the browser does the trick. At this point we could stop now and tell the developer that every time they change their code they need to rerun the above command, but we can do so much better than that. "babel": "babel --presets babel-preset-react src --out-file bundle.js"
"babel": "babel --presets babel-preset-react src --out-file bundle.js --watch"
And finally if we wanted to avoid doing the manual page refreshes we could look to live-server, a great npm package that provides us with live reloading out the box. It’s important to note that this is entirely optional though, and I probably wouldn’t do this immediately for someone brand new - having to manually refresh is no huge deal. And with that I can run npm run live-server to get my app running locally and being reloaded for me when files change. Is the above what I’d recommend for someone new to a library wanting to get started? Yes. Is it what I’d recommend for a very experienced JS developer working on a large app? No. The key takeaway from this blog post is that you can layer tools and functionality as you get more comfortable with the tools and the ecosystem you’re working with. Whilst I’ve used React as the example in this post this applies more generally across the board with any fairly modern JS library (with the exception of Ember and Ember CLI). You should start with nothing, and work your way up, rather than jumping in right at the deep end with some complex boilerplate project. Boilerplates are great if you’re familiar with the environment, but a nightmare for a beginner. Taking time to understand exactly what the tools are doing and why we need them will give a greater understanding and appreciation. By introducing beginners with less complex tools we keep the barrier to entry low and hopefully their enjoyment of the language and libraries high. Finally, yes our tooling can get better and we can definitely make improvements to keep developers happier and more productive. If you’re jumping into a complex React + ES2015 + JSX + whatever else environment, you have to be prepared to deal with the occasional rough edge and tool problem.